Top Tips for Greening Your Business – and Saving Cash! Staff involvement. You don’t have to have an environment manager to turn your business green. Most businesses have environmental enthusiasts who can help drive forward ideas. Get staff to form a Green Team. Put up a Green Board so staff can see progress as well as add great new ideas. Have fun. Saving the environment is important but it doesn’t always have to be so deadpan. Hold a company Green Day to explore why environmental issues matter and what can be done. Offer prizes! £50 for the best idea to save the company money can be a worthwhile capital investment. Find out what other businesses are doing. 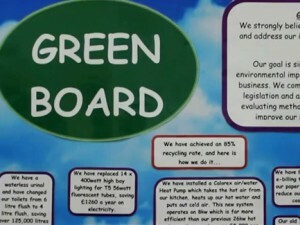 There may be great green initiatives going on next door whilst you’ve still got your head stuck in landfill! Talk to your neighbours or other businesses in your industry to find out what really works and what doesn’t. By working together it may also be possible to pool resources and reduce costs for all. The Sustainable Business Network is a great place to start to meet like-minded businesses. Reduce, reuse, recycle. We have already paid for most of the waste we dispose of, so reducing waste can cut costs at both ends. Reduce. Ask your suppliers not to use such oversized boxes and see if they’ll take back empty packaging. It’s a win-win situation, saving them material costs and you disposal charges. Reuse. If that cardboard box is still in good nick, why not send out your finished products in it? Impress your customers with your green thinking. Recycle. Landfill tax is rocketing. You may even pick up a few quid for those old pallets or that vat of old cooking oil! Get on top of your utilities. Do you find your utility bills overcomplicated and full of small print? Do you know what CCL* stands for on your electricity bill? And more importantly, why it costs you £50 every month? Delve into you bills to find quick savings. Learn more at a UTILISE Workshop, free to attend for small and medium sized businesses. Look at your supply chain. Put pressure on your supply chain to improve their green credentials. Try to buy recycled products – close the loop and help build green markets. Shout about it! Let people know of your green achievements and win new customers. Consider going for a Green Award or a recognised standard, such as ISO14001, BS8555 or STEM; increasingly sought by larger firms in the tendering process. *Climate Change Levy – a tax per kWh of fossil fuel derived energy used.